A few years on from the first Hololens, Microsoft Hololens 2 is available for preorder for $3500. In comparison, its lighter and smaller than the original and has some significant improvements. Due out later this year, it will only be sold to corporations, who wish to make this technology available for their workers and wont be sold to individual customers. 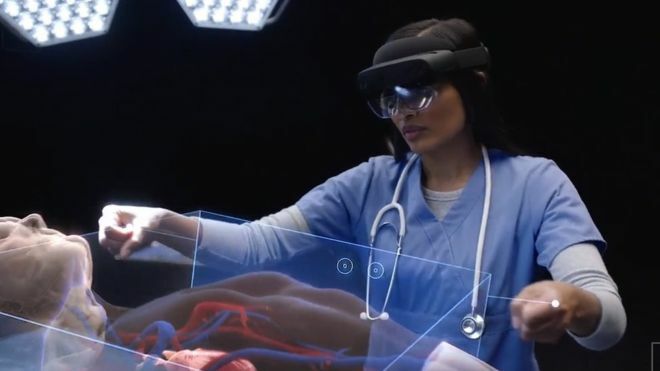 The Hololens 2 is designed with "first-line workers" in mind - from auto shops to factory floors, operating rooms and out on the field doing on-site repairs. It's design is keeping in mind that people who work with their hands find it hard to also use a smart phone or a laptop. It's all about helping in the areas that the smart phone type technology can't help with. A lot has changed with the Hololens 2 compared to its predecessor. It's a fairly large step forward and packed with new technologies. This version is more comfortable, so wearing it for extended periods will be easier and it has an entirely new display system. Another improvement is its field of view which is much larger, so you don't have things jumping in and out of view. It features new technologies like an ARM processor, the Azure Kinect sensor and new eye-tracking sensors. Other features include realistic sounds coming from two speakers, as well its ability to see what your hands are doing more accurately. The visor also flips up. Also new is its 8-megapixel front-facing camera for video conferencing, with a full 6 degrees of tracking and it also uses USB-C for charging. of the field of view. In doing this, it doesn't feel like you're looking through a rectangle anymore. According to Microsoft, its like each eye has the equivalent of a 2k display in front of it. A more precise spec is that it has 'holographic density of 47 pixels per degree', which means you can read about an 8-point font size. Normally with technology products, manufacturers often seek improvements by increasing battery power or using faster processors and the like. But Microsoft, in order to improve the display, has realised it also needed to be lighter and has used a new kind of display technology for the Hololens 2. Laser-based displays are becoming popular among VR/AR based technologies. Intels Vault project, which involves the use of lasers, and North Focals smart glasses, both use this technology. Microsoft is taking this same technology one step further. Hololens 2 lasers shine directly into a set of mirrors that oscillate at 54,000 cycles per second, at this speed reflected light paints the display. These two peices working together, form the basis of microelectromechanical system (MEMS) display. While that part is hard enough, the hardest part for this display is getting the image right into the eye ball. The North Focals project has solved this problem by using holographic film on the lens, to reflect the image directly into the retina. This of course has drawbacks, such as a tiny display with low resolution. The most problematic part is simply ensuring the display is aimed correctly at your eye. It means for North Focals, the image will sometimes disappear completely, if it is misaligned. Wave guides are an important feature and were used with the original Hololens. Microsoft created a whole new etching system for the wave guides for Hololens 2. Wave guides involve pieces of etched glass that reflect the holograms in front of your eyes, directing light to the right place. Hololens 2 wave guides are much lighter as there are two sandwiched glass plates instead of three. By increasing the angle of the mirrors that reflect the laser light, wider angles are achieved, resulting in a bigger, brighter image. Due to the fact that wave guides lose a significant amount of light, the lasers in the Hololens 2 are much brighter. Displays were set at 500 nits for a demonstration but Microsoft could go much brighter for the final version, depending on the power draw. While alignment is easier with wave-guides, it is by no means perfect. This is why Microsoft uses two small cameras on the bridge of nose, directed at your eyes. This measures the distance between your pupils to get the image to just the right place for perfect viewing, as most peoples eyes are not evenly placed. Another side point of these cameras is that they can scan your retinas to log you into the Hololens 2 securely. There is also support for the new Windows Hello. Putting these three technologies together, lasers, mirrors and wave guides, you get much brighter display with a wider field of view. The wave-guides in the Hololens 2 don't require fitting or measurements, You can pretty much just put it straight on your head and get going. It requires significant computing power to achieve this. Hololens 2 uses the best of new, innovative technologies, as you would expect from Microsoft. Most significant medical advances and innovations of the past years have been diagnostic imaging: computerized tomography-CT, magnetic resonance, ultrasonography not forgetting mammography. Currently, most surgery involves some scanning before incision. For emergencies, medical surgeons have the CT or ultrasound to guide the procedure. Imaging is carried out in real time in point-of-care during small and big practices. Visual data is shown on 3D flat screen, the displays where the health surgeons look away from the patient with their hands while taking the operations. Also, the images aren’t displayed from the viewing angle, but from the imaging device. The medical doctor must use imagination skills to psychologically project the photos and understand while they’re doing the procedures. Different forms of visual are shown partly, and the surgeons have additional undeviating attention to multiple mentally fusing image forms like the CT and angiography into a logical structure of the client. Augmented reality technology that superimposes digital information from the real world changes all this. In the envisioned application the doctor using augmented reality headset like Microsoft’s HoloLens will be able to observe data directly and digital images overlaid on her field of view. The medical doctor need not look opposite from the patient to several various displays to interpret and gather this information. Augmented realty’s ability to concurrently and parallel display patient’s information and another imaging part could decrease medical errors and save lives. This is a procedure done outside the operation room. The operation room is the safest place in the hospital where a single patient is attended to by a team of 5 to 9 dedicated nurses and doctors. Every patient has pre-operative imaging, and the process is diligently mapped. Anesthesiologists administer pain controlling drugs; monitor the patient’s physiology and life-saving medication. It is during these procedures that the patients are at risk and where AR provides excellent benefits. In tracking multiple data displays and images, it is easy to miss critical cues for the patient’s status. Single AR display integrates patient’s data and all imaging, allowing the surgeon to keep their eyes on the patient hence improving quality, reducing cost and increasing safety by reducing procedure-related complications. The Video Optical See-Through Augmented System (VOSTAR) amounted display system that superimposes the patient’s imaging diagnostic in a 3D unison with their anatomy. It also presents a patient’s medical information such as body temperature, heart rate, breathing rate, and blood rates, quickly into the surgeon’s field of vision in an attempt to increase accuracy by concentrating on the operation and reducing time. Although AR for surgical procedures has been the talk in industrial and academic research since the 1990s a tool interlinking surgeon’s subjective perception with patients information hasn’t been widely implemented. Latest advances of photonics components such as the high-luminous micro display and LED optical waveguide has been critical in turning what was science fiction into reality. The chief goal of AR in medicine is not just to reduce surgery time but also cost involved and time spent under anesthetic during operation. You are saving 20 minutes every three hours of surgery and a guarantee of actual intervention. Making surgeries less painful and invasive: at times surgeons peer inside the human body to have a look at the state of critical organs. But with the help of augmented reality, medical consultants are using computerized tomography technology coupled with magnetic imaging scanners to create a real like three-dimensional image of the patient's organs. The images are analyzed by the use of HoloLens to look at the virtual picture of the client's organs and come up with important decisions. With AR delivered through technologies such as Google Glass, surgeons receive unprecedented real-time insight on operational procedures. The technology exists to create virtual overlay across the medical practitioner’s real-world view, guiding them through the surgery steps for patient’s safety and enhanced performance. Credits to 3D modeling, AR can help localize tumors, giving the surgeon X-ray vision without coming in contact with the harmful radiation. Any field of anatomy can be located, modeled and high lightened with point accuracy. The digital technology allows the surgeon to capture mid-procedure pictures that will be added to patients medical records. Surgery is a highly sophisticated profession. Taking a lot of practice and learning in a range of procedures to be competent- and that is expensive. In the past surgical training would take place in medical theatres, with students given running commentary and briefs of procedures as surgeons worked. This is vanishing with time. The demand for the availability of surgeon’s time and operating theatres are too high. To handle these companies have created thousands of training simulations for portable devices that allow students to follow the surgical procedures keenly. Thanks to AR advent. The augmented reality has made simulations far more authentic, engaging and interactive, which is excellent for learning the outcome. AR is making it faster, cheaper and more comfortable for trainees to learn and field surgeons to practice their procedures before the operation. This is great for patient’s safety. Sterilization challenges are using when it comes to utilizing AR technologies in theatre. Headsets are a source of contamination and unresponsive to anti-microbial scrub down. Gesture tracking, voice control, and foot pedals are the potential options to square the circle. A simple remote control crowned in a sterile bag would work. Augmented reality is assisting surgeons in cardiovascular procedures and replacing the aortic and repairing of the hearts mitral valve. In the future, the use of AR in the medical field is only going to grow. We’re confident this fantastic technology is going to make sophisticated surgeries simple, precise and less painful for patients. The application of AR is on board, but it is just the beginning. None can predict the feature, but one sure thing is up for exciting times ahead with AR technology. With the widespread adoption of AR among trainees and surgeons, the future of surgery is more efficient and safer than ever before. What is Augmented Reality and How Can It Help Your Business Today? Augmented reality is the technology that enlarges our physical world by adding digital information layers to it. Unlike the Virtual Reality, augmented reality doesn’t create a complete artificial surrounding to substitute real with virtual. AR emerges an indirect vision of the existing location and adds graphics, videos, and sounds. AR currently presents a new world of possibilities and situations for contemporary businesses. Majority of organizations and businesses share a common goal of getting new customers and clients to purchase their product and use their services. To specifically achieve these entities must engage meaningfully with potential customers, educate users about their services and products, and create long-term connections for future commerce. AR is viewing of real-world physical atmosphere with superimposed processor generated images, hence shifting the real perception of reality. Envision developing a whole brand new car. There are myriad considerations at play: you want to innovate and achieve style without detracting from functionality. AR can ease this development, allowing visualization of the car’s different specifications before committing to building a model. You need not to be a car designer to see this immense advantage. A new product that is costly to demo can be easily tested and visualized via AR before investing in the next step. The biggest challenge about online shopping is that you don’t know whether that hutch fits well in your kitchen or that shirt will look good on you. These reservations stop consumers from making purchases. AR empowers you to try on glasses, clothes or jewelry by overlaying them onto your image. This can be done with the help of a smartphone camera or online. And you can try out a new couch in your warren to make sure the color and size are right. Cosmetic shops are getting outfitted with AR mirrors overlaying different makeup looks and styles onto the customer’s face. The process is a more straightforward and quicker way to try out a new thespian transformation without using tester lipstick. You can use sophisticated analytical tools to monitor customer’s preferences and provide customized product offers, therefore increasing the probability of purchases. The world leading online retailer Amazon has implemented AR view features in a mobile application. AR can be helpful in identifying improvements in your business operations. Car manufacturers are testing capability using AR systems. They are empowered to improve the durability and safety of their vehicles. Using AR to imagine and test new processes, scenarios or workflow gives advantages to firms that feel these procedures are slowing them down. The most efficient solution will be found from as many test scenarios as possible. Most mobile games have been successfully engaging consumers with branded AR experiences. Businesses can promote themselves a good example is the Pokemon. Some offer coupons and discounts for visitors, while others are thrilled to get new clients in the door. Companies are creating their own interactive experiences or scavenger hunt-style to drive interactions. Advertisers are connecting AR ads that appear to consumers while playing their favorite video games. In 2018 AR advertising is estimated to have reached $12.80. The hyper-local nature of the AR makes it possible to reach people in your town or down the streets if you have a brick and mortar location. A considerable number of employees who receive sub-par training leave their job with the first eight months. Meaning there is a direct link between employment success and training and retention. AR can help in an instance that manufacturing operations mistake has caused injury to the employees or has to shut down services. AR overlays critical information onto virtual display speeding up or increasing their progress. The modern customer is a digital consumer. Majority of shoppers are using mobile gadgets when shopping in traditional brick and mortar shops. Buyers use their smartphones to find product information, read product reviews and compare prices. AR allows enhancing buyers’ journey by giving instant product and service information. Clients can use their phones to receive valuable information and scan products on shelves about them instantly. Potential customers particular the youths are more interested in products accompanied by entertainment. AR technology opens up opportunities for retailers to boost sales through interactive experiences. It is more comfortable selling everyday place products since people get entertainment along with their products. AR can turn conventional paper books into interactive and immersive augmented reality books that interesting to interact with and read. AR can help instill the reading culture in children hence improving their academic performance. Retailers know how important product placement is. Retail businesses take product placement sternly because placing a right product on the right shelves boosts purchase. Retailers have created detailed planograms for in-store space plan. However, products are frequently misplaced resulting in substantial financial losses for retailers. AR provides an easy way to ascertain that products are well positioned on shelves according to the program. Employees can instantly check for misplaced products using portable devices to scan. To gain ground and grow businesses need to increase sales. To overcome this challenge they use techniques like the augmented reality as launching market campaigns and offering competitive prices. AR is a secret weapon helping companies to drive sales and outperform competitors. One in four consumers will purchase a product after previewing it in AR. Hence augmented reality is not just a hot buzzword but an incredibly essential tool for online firms and their brick and mortar correspondents. Augmented reality has potential in the retail industry. It is time to implement the AR. The cases above have illustrated that the world’s largest offline and online businesses have jumped on the AR bandwagon and others are following. To grow and stay afloat modern businesses are launching stellar marking campaigns using the AR technology, use in-depth data analysis to reach their audiences and provide almost instant customer support. These methods are critical and to succeed the innovations is to draw attention to the augmented reality that has taken the business world by a storm in the past years. And using AR gives you an advantage over your competitors that you should not miss out.